There is a very special drawer in my kitchen. It is the ‘Drawer of No Return’ kitchen utensils, a sort of graveyard of gadgets. It is very possible that you may have a similar storage area of cast-offs. Zoomie, a local wordsmith was cleaning out her drawer and gifted me these ‘Steak Buttons’. They are little tiny thermometers that are meant for steaks on the grill. 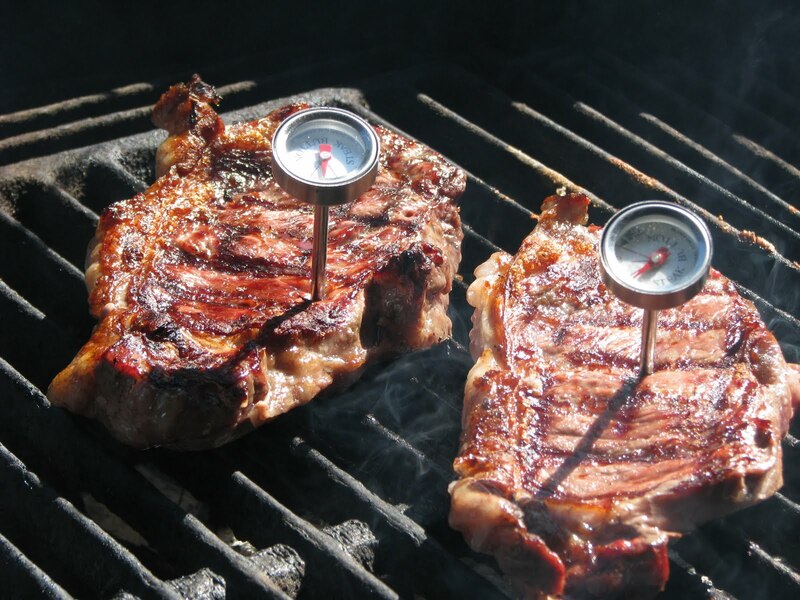 They are placed on your steaks and the gauge will inform you of the degree of doneness. 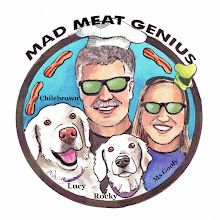 They seemed like a novel idea and we just so happen to be cooking some steaks this weekend. Hundreds of steaks have visited my grill. 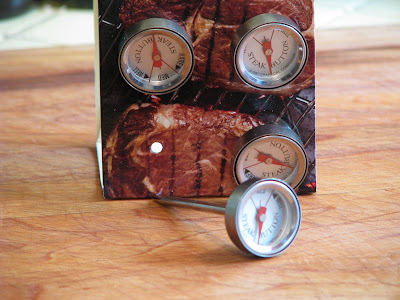 I do admit to using an instant read thermometer for larger cuts and roasts. It is an important tool. Tonight a couple of one inch thick ‘New York’ steaks from Angelo’s will be our test meat. A hot mesquite fire was started. The grill was cleaned and oiled. 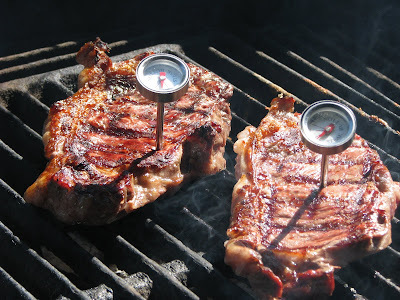 Three minutes of cooking time and the steaks were rotated for grill marks. After six minutes the steaks were turned and the steak buttons were inserted. Nine minutes have elapsed, and in my opinion, from past experience the steaks were done to medium rare. Will the steak buttons confirm this? I looked down at the buttons and realized they were tiny little things. I could not read them unless I had some powerful glasses or a magnifying glass. I tried to get a little closer but I did not want to singe my eye brows. The steaks did turn out medium rare. This was the end of our little experiment. In conclusion the ‘Steak Buttons’ are destined for the “Drawer of No Return”. I have this vision of you with singed eyebrows in the name of meat science :) I'm betting that you can touch a steak with you finger and tell if it is done. Well, I never used them, either, but for a different reason. Sorry they weren't a big hit with you but perhaps that's why they were on sale at Williams Sonoma - everyone else realized their shortcomings. Greg, I have scars on my fingers but my eyebrows are intact. A amaller steak I can do by feel. A larger one I ususlly double check with an instant read thermometer. Zoomie, It is the thought that counts. I will think of a good use for them someday. 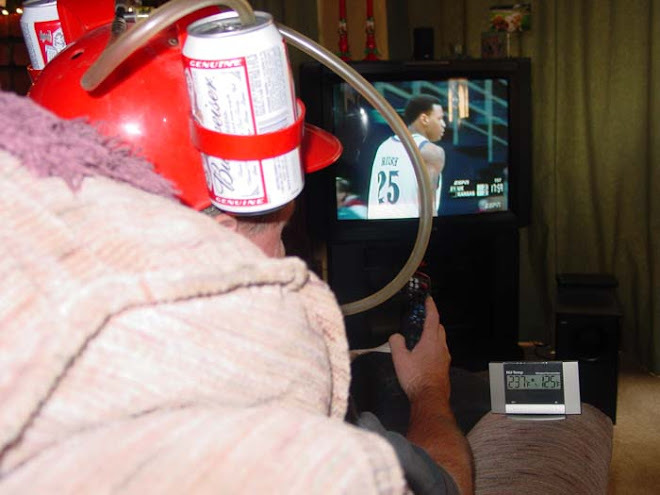 I just don't know what to say about those stupid things. Yeah, nothing. I could confess to a few of my own gadgets of doom. I have the same drawer. We food bloggers ought to do a gag gift thing in the holidays where we "gift" each other 3 things from our "drawer of no return".